Many of the best soils for agriculture are alluvial deposits found on flood plains along rivers. In Vermont, one of these rivers is the Winooski River which flows through Burlington into Lake Champlain. Over recent years, as part of the upswing in the local food movement, many small farms have been attracted to the innovative farm incubator and food hub called the Intervale Center in Burlington. However, while its location in Burlington is prime for proximity to local food fans, its river-bank location on the WInooski leaves a number of the farms at risk to flooding. 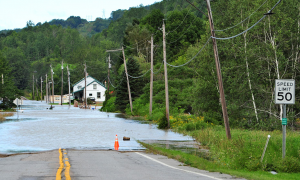 Since 1970, the frequency of severe flood events has increased in Vermont with the amount of rainfall falling during very heavy precipitation events up by 67%. Hurricane Irene damaged over 9000 acres of Vermont’s farmland, causing economic losses of about $20 billion with many farms losing all of their crops. See photos taken from helicopter of flood damage along river corridors in Vermont. 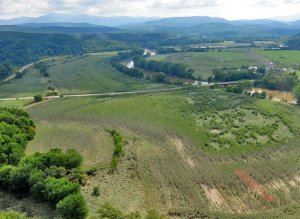 At the Intervale, a number of farms were willing to “stick it out” after one big flood event, but by the time, another extreme event hit the farm and destroyed crops, it was time to reconsider the farm’s location. We have identified several farms and farmers who have recently made the decisionto move to higher ground in Vermont. Evening Song Farm moved to Cuttingsville, Vermont. Our first interview is with Amanda Andrews, co-owner of Tamarack Hollow Farm, who moved her farm from a location near the Intervale in Burlington to a new site in Plainfield, Vermont.